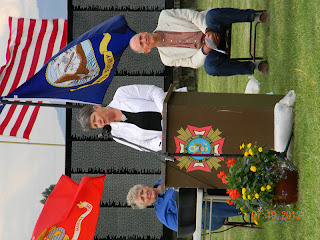 Thursday Night, my friend and coworker Carole Halvorson, who was a nurse in Vietnam was the guest speaker. On Army night: Carole telling us about the 11,000 nurses that were in Vietnam. She was 23 years old at the time with only 1 and 1/2 years of nursing under her belt, and as a pediatric nurse. The hospital she was at, was on an airbase and it was attacked twice with rockets. Her husband Bob, is seated and wearing the tan jacket. He is also a Vietnam Vet, who was in combat, but they did not know each other at the time. 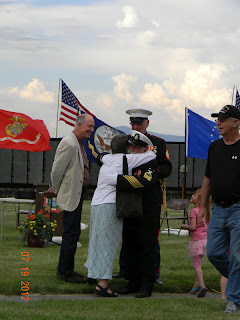 Bob (tan jacket), Carole and Byron - Byron is Veteran Services Officer, also a coworker, and he is largely responsible for the wall coming to our rural area. 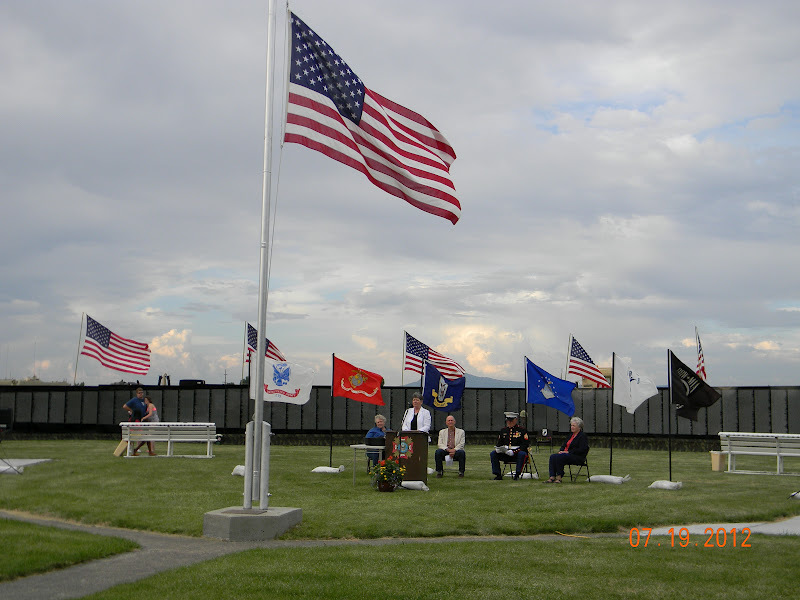 The town of La Grande, Oregon was privileged to host the Vietnam Moving wall from Thursday night until Monday, tomorrow, at 2pm. 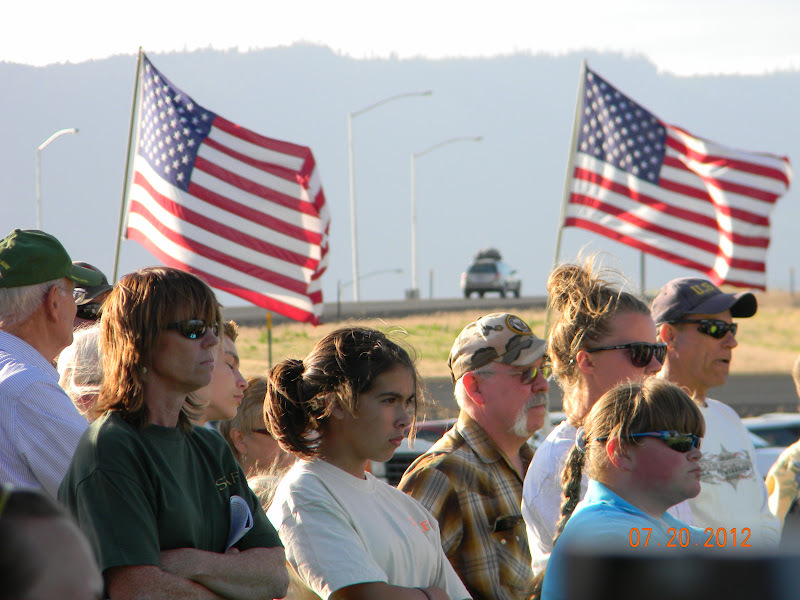 Each night a different branch of the armed forces is celebrated. Thursday night was Army night, and one of my coworkers was the honored speaker, and her husband gave the benediction. I am amazed at the stories each person carries. I have known Carole through other circles in my life - she and her husband raise beef, and are very active in a nonprofit that I used to work for. She is a psychiatric nurse where I work, and both she and Bob are very active in their church. I never knew about her life in Vietnam, that is, until last week. She was 23 when she went over as an Army medical nurse. A young nurse, who worked with babies, not grown men and women. That soon changed. She served 15 months on her first tour, yes, first tour in Vietnam. 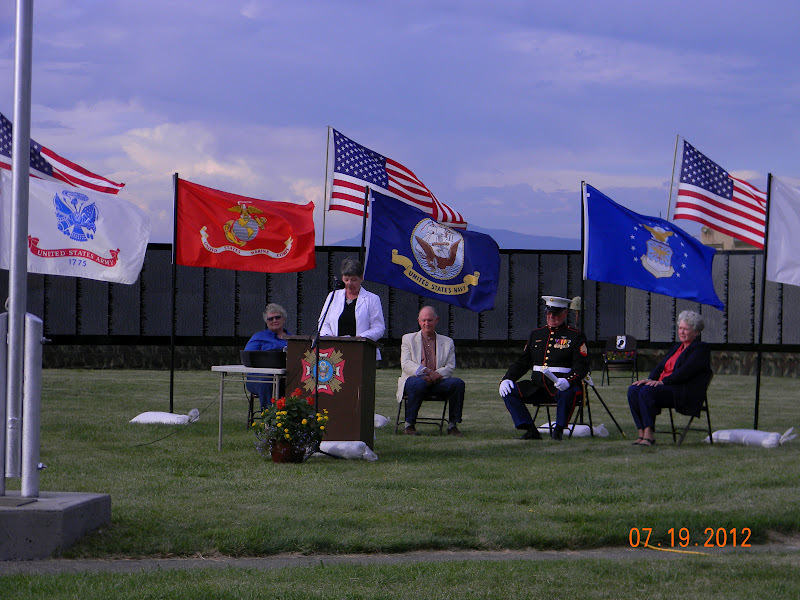 And, she was stationed at a hospital on an airbase. Her husband also served in the Army. He was in combat. A man that I know as a soft spoken gentle person. He fought. Anyway. Again, I am amazed at the things people have done and carry with them without others ever knowing. Sami's school, North Powder High School (she is entering 9th grade - yikes!) was the ONLY school out of six school districts in Union County to come and volunteer to help with this event. I am very proud of our little school and the fact that they stepped up to help. 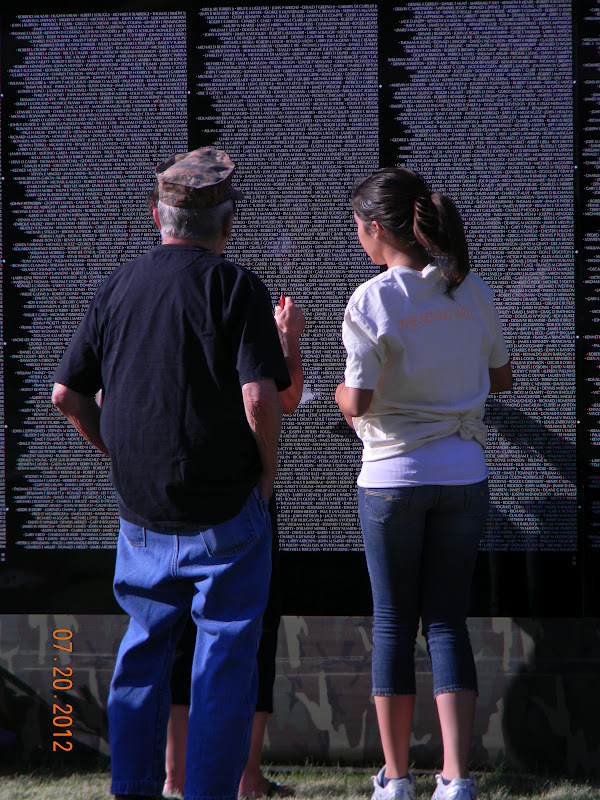 She also got to learn about this war, a valuable history lesson that hits home when you see and hear from those that were actually there. 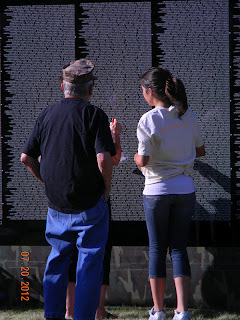 I did not have any relatives (that I know of) that were in Vietnam. 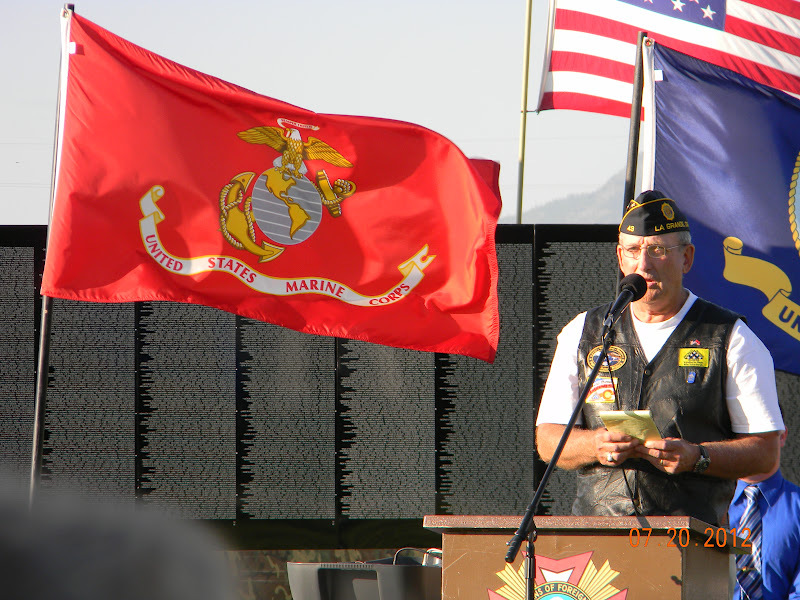 Perhaps in my Dad's family - he was a marine that went to Korea (not in combat). Yet, I do remember when I was about 10 or so, playing on a playground in San Bruno, CA and asking what the bracelet was on a friend's wrist. It had a name of a POW. It was the first I saw, and certainly not the last. The brochure I picked up from the event said the war started in 1955, and ended in 1975. 20 years. Strange, how in 1975 I was 13 years old, just a year younger than Sami is right now. I was oblivious. She, however, is not. I am very grateful to those that went over, and so very sorry to learn of all the casualties. 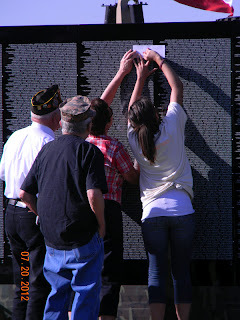 There are 58,267 names on the wall. Peace be with them all. I was a college student in this era, and it's a crime how our veterans coming home from this war were treated....so glad to see that this may help to ease that for those who survived. Amazingly, I only knew 1 person, a neighbor my age from high school, who we lost from that time. He was only 18 or so.....so sad. 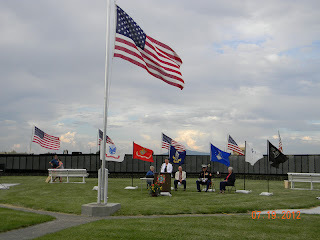 I have been fortunate to visit the wall in Washington DC, and it is a very moving site. Thanks for posting this, Andi.